This looks and sounds so freakin’ delicious!!! It is pretty good!! I decided at the last minute to bake it, and I definitely think it was the right decision! Definitely! The original recipe used both jalapenos and diced green chiles, I just left them out. So I’m sure you could swap ’em! It would be good with poblanos, too! I love the image of Nemo on the map. That’s what I imagined every time they said Nemo on the news. 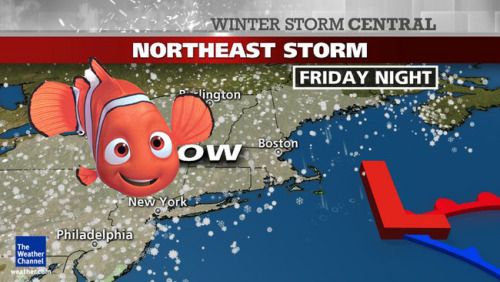 If you ask me, they should’ve named the storm after a villain not a good little guy like Nemo. I’m pretty sure people would’ve been a lot more worried about the snowstorm if it was called Cruella. Sorry for the rant..haha. The Mac and Cheese looks nuts. My boyfriend and I are big on spice, so this looks perfect for us. haha I love it! I think you’re right… I mean, who do they have picking these names anyway? I don’t know why they started naming winter storms. You can definitely add more jalapenos or other chiles for spice – this is definitely tame (in my opinion) if you love spice! This looks so good! Such a fun recipe. I live in Connecticut and got 2.5 feet of snow! So I did a bunch of cooking indoors! I adore Mac & Cheese and will have to try this version with jalepenos. Yum!